I'm sorry this has taken me so long to post. I have about a million other things (maybe not quite that many) that I wanted to post from the time of my last post and hen she was born, but it makes me feel overwhelmed trying to do all of that to catch up. So, I'm going to skip ahead to our most recent and exciting news! And I may or may not get to the other stuff, but I gotta start somewhere. We will start our story on the morning of Dec. 31. We really weren't expecting her to come early, because none of the other kids had. Easton was 3 days late, in fact. Anyway, we started out this exciting day going to the shop with the kids to get some work done, with the promise of some fun as soon as we finished a few things. I was feeling contractions here and there, but nothing consistent and nothing really painful. So I think I was helping sew up a deer or something, I know- sounds like fun right? :) When we finished that afternoon, we went home ate lunch and decided it was time for the kids to get some use out of the new sleds they had gotten for Christmas. Oh, I should mention, we were anticipating the arrival of Grandma and Grandpa Briggs. They were coming to stay with us until little Montana arrived to help with the kids and they were on their way. So, we just went to the park where there is a nice mellow hill that we thought would be fun for them. ﻿The above pictures are of the kids going over the sweet jump! I am the shadow taking the picture. I had as much fun watching and taking pictures as they did sledding. :) Now, at this point I was feeling more regular contractions, but not real painful yet and not too close together. Josh was brave and took all the kids at once down the hill. In the end they crashed, but they were all smiles! After all the fun we went home to have hot chocolate to warm us up. At this point my contractions were getting closer and I was becoming convinced that this was the real thing, and really hoping that my parents would get here soon! They got to the house just about the time that we were finishing up our hot chocolate, and perfect timing too! Because we were just getting ready to leave for the hospital. I think my contractions were about 5 minutes apart, but I didn't want to wait for them to get any closer because with Easton, we waited longer and we almost didn't make it to the hospital! So, Grandpa volunteered to stay with the kiddos while Josh, Grandma, and I went. I was still pretty calm and breathing through my contractions pretty well by the time we arrived. We went in the emergency entrance (since it was after hours), they got us signed in and took us up to the labor and delivery. I guess I didn't look like I was in too much distress because they didn't look like they were in too much of a hurry getting me into a room. But after they checked me and saw that I was at a 7, they knew I was for real. I was surprised that I was already that far because I wasn't in as much pain as I remembered with Easton. Deep breaths in and out really helped me manage my pain, that's the only way I can explain it. We were going to go natural again and I admit, I was pretty nervous because the last time I remembered ( I thought I remembered) how much pain I was in at the very end and it scared me to think of doing it again. But the reason I still wanted to was because of how I felt afterward and how the baby was. So, I guess there's not really a lot to tell. My breathing got me through even the really painful contractions, all the way up till it was time to push. I admit it did get more painful and when it was time to push, I felt like I lost it. There was some screaming...but to my defense, Josh says that I really only really screamed for less than a minute, although it felt like longer to me. :) But he said they were all very impressed by how I handled it all. Which made me feel good, but in my mind it got a little crazy at the end. But, she arrived safe and sound and beautiful. We are soooo happy she is here with us:) We had to stay a little longer in the hospital because I tested positive for group B strep and they wanted to make sure nothing was passed to her. But almost 48 hours later, we were able to go home. It was disappointing that the kids couldn't come and see her in the hospital because they were not allowing anyone under the age of 14 because of flu/RSV season. Alma is an especially helpful big sister! Of course, Easton had to get his snuggle time in. She has been a part of our family for 2 months already! I can't believe how fast the time goes by and how quick they grow. We love her so much and are so thankful for her safe arrival. Oh, and about her name. Josh and I were having a hard time deciding on a name that we both liked and there were a lot of names thrown around. But the first time "Montana" was mentioned, we both liked it from the start :) and we didn't need too much time to decide that it was the winner! Her middle name, May, is after 3 wonderful women on both sides of our families whom we love very much. We hope she will grow up to have many of their same qualities mixed in with many of her own. Every year, we get to go pick out our Christmas tree in the mountains. This year it was pretty cold, but it's a fun tradition and I'm glad we are able to do it together. The kids have fun trying to find the perfect tree, even if we have to hike around a bit. On November 3, 2012, Alma chose to be baptised. It was a very special day shared by family and friends. This was a first in our little family and will always be remembered. It was Josh's first opportunity to baptize someone, and how awesome that it was our daughter. That morning she was kind of emotional, I think because of nerves. But I asked her what was wrong and she said "I wish I could stay little, I don't like growing up". She is such a cautious, caring person and she really thinks about things. She said she didn't like being the first to do things, because it's kind of scary not knowing exactly what to expect. So, Josh and I tried to help her see all the good things there are about growing up and being the oldest. And we told her that she was meant to be the oldest child in our family because she teaches Saralyn and Easton so much, and that Heavenly Father knew she would be a good helper. When we were done talking, she seemed to feel better and excited again about her special day. ﻿ ﻿﻿﻿﻿We love you Alma and are so proud of your decision to be baptized. We had a fun Halloween and hope you all did too! I'm not usually much of a dresser-upper, but since I am working at the school, I thought it might be fun...maybe. Problem? I didn't know what to dress up as (lack of creativity, I guess). So, I woke Josh up early that morning and said "Help, I need a costume!" And from nothing, he came up with something....a Pirate! and a pregnant one at that! The biggest fear is that no one will know what you are, but I didn't have that problem :) So thanks Sweetie, for saving the day. The kids were: Alma - vampire; Saralyn - Rapunzel; and Easton - camoflauge moose. Easton was being silly, and it took me a few tries to get a good picture of him. This was after trick-or-treating and unfortunately we had grown tired of Rapunzel's locks and our vampire "just had to" get in the bath because her hairsprayed, ratted hair was driving her crazy! Happy Halloween everyone! Hope you had as much fun as we did! Easton was the only one brave enough to get a picture with the deer. The girls weren't too excited about the idea of holding up the head of a dead deer, suprise suprise :) "no dad, that's gross!" But Easton totally thought it was cool! Wow! 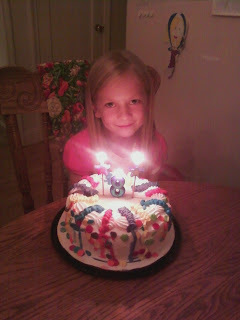 I don't know about any of you, but I totally cannot believe our little girl is 8 years old! I always forget how fast they grow up! Little Alma is growing up, but she's still little to me :) We are so grateful that she is a part of our family. She is so smart, kind, caring, and fun. She loves writing notes to people and making people happy. Saralyn and Easton love her so much and really look to her as an example in all they do. 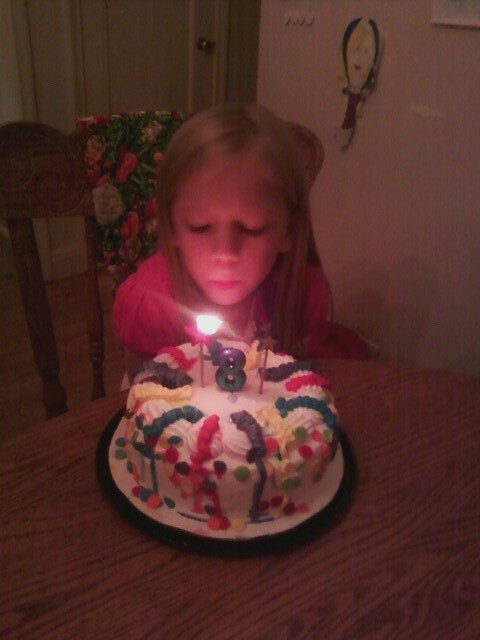 We love her sooooo much, and had a great time celebrating with her on her special day. On her actual birthday we had icecream cake and had some fun family time together. So, the time for our garden has come to an end, for this year. And we finally were able to pick the pumpkins! Some of them were still green, but we figured it was good enough since we were cleaning out the garden and didn't want to put it off any longer.